What Is Webtalk Beta? Review Of A New Social Network. Social media have become important parts of our everyday lives. Not only are they means of communication between friends and family members, but also an important marketplace for businesses. This is a review of a new social network, called Webtalk, which is still in Beta testing, but has already over 1,9 million users. What is Webtalk and why is it different from the other existing social media? Facebook, Twitter, Pinterest, Instagram, YouTube, Snapchat, Tumblr, Google Plus and LinkedIn are some of the most popular social networks online. The reason why all these platforms exist is because they are all slightly different and allow the users to separate activities, contacts and interests just like they do in real life. 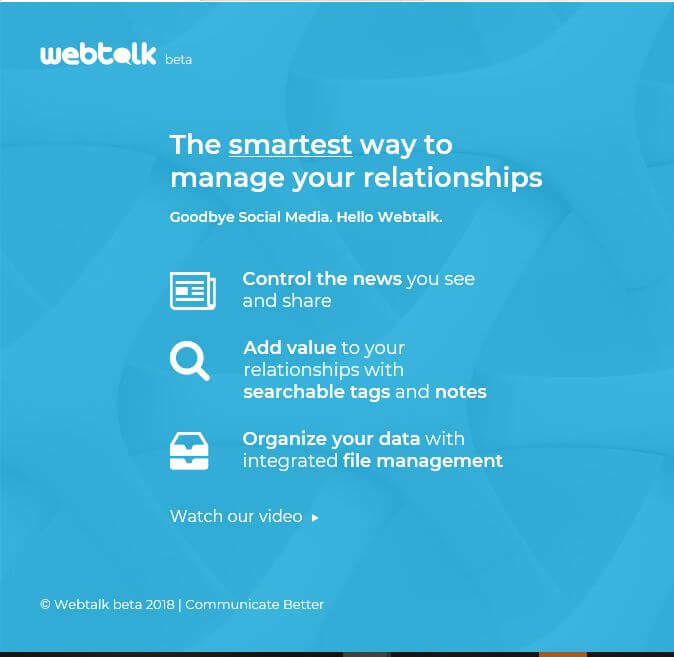 The main idea behind Webtalk is to manage all these activities, contacts and interests all in one place and without lines crossing, giving the user complete control of his/her content, relationships, news and privacy. Webtalk is giving you the opportunity to create your own personalized algorithms for content sharing, the news you want to see, categorizing contacts (both your personal and professional networks separately) or protecting your privacy. Just imagine being able to do what you do on Facebook and LinkedIn all on one platform, managing effectively and successfully all the areas of your life, without them meeting. This is what Webtalk allows you to do. Webtalk is only a few months old and has already nearly 2 million users. Since it is still in beta testing, the sign-up is invitation only. Use the button below to register and explore Webtalk’s groundbreaking features. What are the features and the benefits of Webtalk? 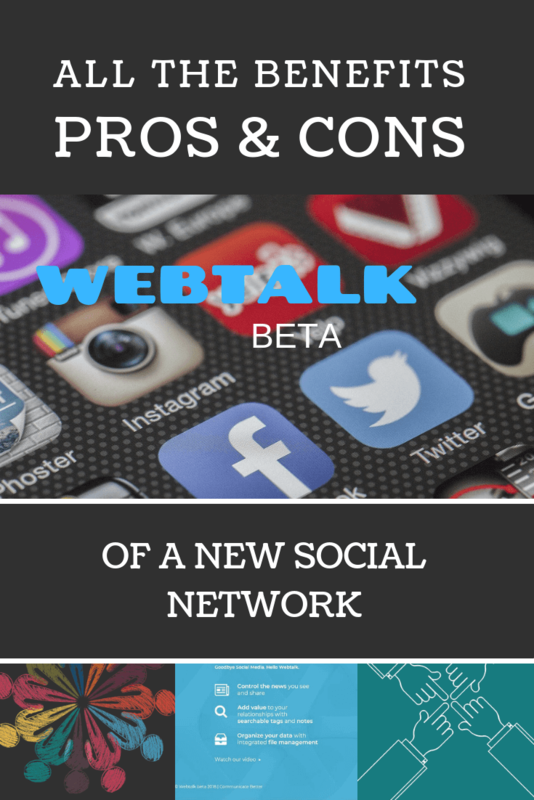 The different personalized settings for the newsfeed, personal and professional networks, contents and privacy are among the most important features that highlight the enormous potential of Webtalk to become The Social Network of the future. Just imagine sharing a picture on one of your favourite social networks and being able to decide who of your friends can see it. Webtalk makes it possible! Add contact values (in order to segregate different types of relationships). Filter feed by keyword (smart search with AI coming soon). File gallery + shareable links. Apart from merging all the best features from the other social platforms, solving their pain points and adding some own unique features, Webtalk is also offering all of its Beta testers up to 50% of its revenue for life, that will begin paying after the beta testing is complete, as a token of appreciation for helping grow the community of Webtalk. whenever referrals upgrade their accounts to receive premium features etc. Webtalk is offering the 5-Tier Beta tester commission plan bonus to all the users who join NOW, during the Beta testing stage, and help grow the community by inviting their friends, family and colleagues to connect with them on Webtalk. This means that you not only get 10% for your direct referral’s transactions, but also their friends’ transactions. So, grab your invitation to sign-up HERE and start growing your referral list before the beta testing is complete! What are the PROS of Webtalk? It builds a community around trust. The founders (RJ Garbowicz, Dr. Basit Hussain, Joy Randels, James “Jamie” Pews, Mary V. Bernard) are not involved in scams and publicly state their relationship to Webtalk. You can even check their profiles on LinkedIn. It enables you to create a feed of whatever content you want from whoever you want, through patent-pending data organization, filtering, labelling and search technologies (Webtalk’s Social CRM that offers built-in groups and searchable tags right at the connection process). It has a FREE affiliate commission plan. It is time-saving, as you can manage your activities and relationships all in one place. Webtalk is donating 10% of all profits to charity through its Webtalk Foundation. It is a great place to promote your business/blogs/affiliate links etc. What are the CONS of Webtalk? Some features may not be available yet. You can earn commissions only after the beta testing is over. What to do after sign-up? Insert a profile image of yourself (your face). Fill out every Profile section (you can set your own privacy status for each profile section by clicking the Pen Icon). You must have at least 10 connections (follow at least 10 Webtalk members, who will then follow you back). Ask somebody you know within Webtalk or the person who invited you to write a recommendation for you (if it is me then simply send me a message on Webtalk asking for a recommendation). Check that your profile meter is 100% complete. Start inviting your friends to join! These few things may give you the opportunity to earn passive income for life! I have been a Beta tester for Webtalk for almost three months now and I have to say that it has some enormous potential, both in terms of the quality of their product and of the earning potential. The great thing about it is that it is free to join, it has some awesome new features and you have absolutely nothing to lose if you want to explore this platform. Furthermore, it gives you the opportunity not only to take part in an interesting project, but also to earn some passive income in the future. 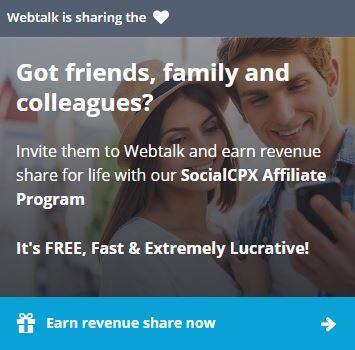 If upon reading this Webtalk review you decide you join, then grab your free invitation by clicking the button below, follow me there and let me know if you need any help. Thank you for reading! Please leave me a comment if you found this post useful. 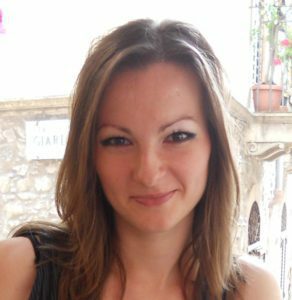 Thanks for such a comprehensive review Marina, it is good to find bloggers who strive to provide their readers with honest insights into new programs. I have to agree with you, Webtalk has a huge potential and I cannot wait to see how the whole thing will unfold. That said, I am not a fan of and I am not comfortable with having to use my real name in order to be eligible for the affiliate commission plan. Make no mistake, I am not planning to use Webtalk the wrong way, my concern is about privacy and safety. I know a few people who would love to join Webtalk and try to earn an income, but are concerned about spammers/scammers and what not. Sadly no social network is immune to dangers, so I believe one should be able to publicly use a nickname, provided that – of course – Webtalk knows who they are. Thank you so much for your feedback, Andrew. I totally understand your point and agree with you about having to use your real name. I’ve been thinking about this and I guess the reason behind this request from the founders of Webtalk is that they are trying to create a platform based on trust, as they state in every public announcement and update, and the 5-tier affiliate program is a sort of a token of appreciation for the users who are willing to make their real names public and thus make the whole platform more trustworthy. I hope they will be able to protect all the members’ privacy and keep the spammers/scammers away in a much more efficient way than the other social networks do.